Monday, need I say more? 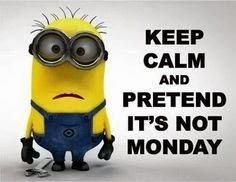 Usually I don't hate Monday mornings, but this particular one I do! I'm not looking forward to my brain MRI and MRA of the head and neck. An hour (or more) of laying on a cold table inside a tube that makes horrendously loud noises. And because it's of my head, no headphones for me! At least I'm exhausted so maybe I'll get lucky and fall asleep. I'm one who can sleep despite the noise. I want to take a second to say stay safe to all my fans, friends and family that are in the path of the snowstorm headed to the east coast. Though I wish we had snow here in the Midwest, not that much snow! Ahhhh, the weekend has arrived!